Repairers still making plans for SEMA Week might want to set aside time Tuesday, Oct. 30, for the final Collision Industry Conference of the year. If you’ve never been to a CIC before, it’s kind of like those summits world leaders are always holding. The quarterly conferences offer an opportunity for all of the different interests in the collision repair ecosystem to discuss some of the industry’s hottest issues. Also, they’re a fantastic chance to network. The November CIC runs from 8 a.m.-5 p.m. Tuesday, Oct. 30, at the Renaissance Hotel in Las Vegas, with a reception at 6:30 p.m. at the Westgate Las Vegas. SSF Imported Auto Parts & Certified Collision Group have sponsored a shuttle, which will depart every 15 minutes from the East Tower of the Westgate between 7-8:45 a.m. and every 15 minutes from the Renaissance between 5-6:15 p.m. Registration is $75 at the door; $65 in advance. Check for hotel availability by checking online here. The organization on Thursday announced the agenda for the session. 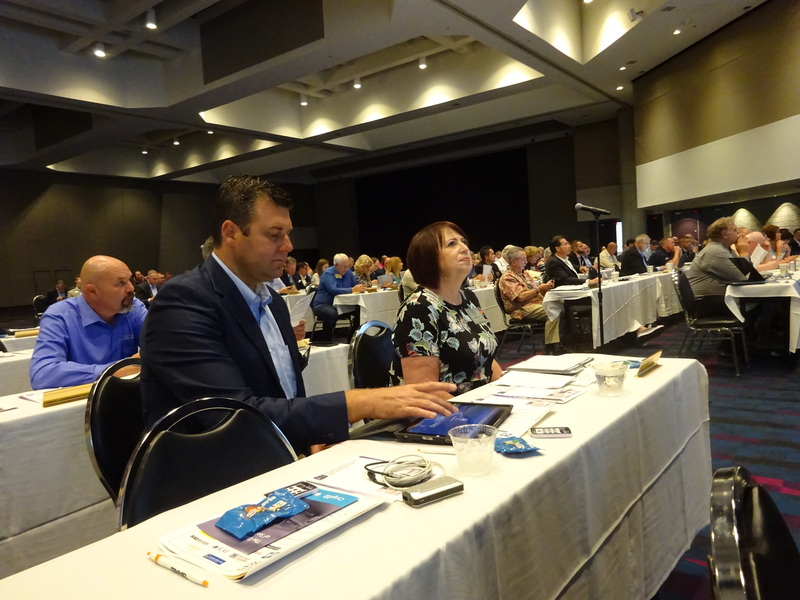 8:45 a.m.: Incoming CIC Chairman Jeff Peevy (Automotive Management Institute) and his Education Committee Co-Chairman Gene Lopez (Seidner’s Collision Centers) will review their “OEM study on Required Training Skills,” according to the agenda. They’ll also provide more details about their research into industry credentials. In April, Peevy said he’d like to see promotion that repairers should be earning and requiring professional credentials, and the task force sought to compile a list of what was available today. In August, it identified 62 credentials existing in the industry. According to Peevy, 1 in 10 landscaping company owners and managers has an industry credential. “They’re ahead of us,” he said. In the medical field, 75 percent of a hospital’s staff has professional credentials, he said. An informal audience poll found 71 percent of the 137 respondents felt “role-based, verifiable credentials” would assist “next generation recruitment/industry perception.” Another 23 percent said it “Somewhat” would, while the others said nay. 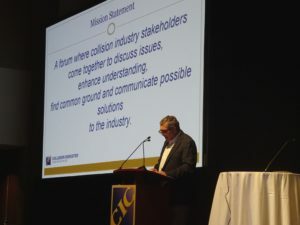 “Wrapping up the morning session, the Governmental Committee will continue by state and federal public policy outlook with a snapshot of the views of collision industry segments,” CIC wrote in a news release. 2 p.m.: Insurer-Repairer Relations Committee Co-Chairmen Doug Irish (AccuracyDriven4, Fayetteville Technical Community College) and Matthew McDonnell (Big Sky Collision) will present a panel discussion on third-party auto repair claims. 8:30 a.m.: Collision Industry Foundation President Bill Shaw (PPG) and board member and disaster relief Chairman Michael Quinn (AirPro) will make a presentation. It’s possible it could include news of those helped following Hurricanes Florence and Michael, although so far the organization hasn’t received any takers post-Florence. The 501(c)3 charity provides replacement tools and necessities to collision professionals and shops impacted by catastrophes. In November 2017, it reported helping 63 auto body repair industry families, three “severely impacted” shops and one vo-tech school last year following disasters like Hurricanes Harvey and Irma. Quinn in September said CIF was “still mopping up from Irma” into this year. 3:30 p.m.: Hear a special presentation from Abagayle Boden, recipient of one of the 3M Hire our Heroes scholarships awarded to family of current service members or veterans and a bronze medalist in the 2018 SkillsUSA high school collision repair category. If you’re feeling discouraged about the technician shortage, hearing from those two will probably make you a little more optimistic about the future of the workforce.